Hot Dice Scratch Card Guide & Review - Casino Answers! 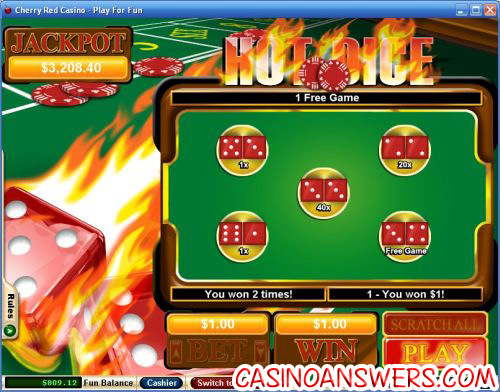 Hot Dice is an online scratch card game developed by Realtime Gaming with a progressive jackpot. You can play the Hot Dice instant win scratch card game at US-friendly online casinos Lucky Red Casino and Rushmore Casino. Playing the Hot Dice scratch and win card is easy. Simply place your bet of $1, $2, $5 or $10 and then hit the “Play” button. Your bet will be placed and a new card will be generated. You can either scratch each card manually by clicking on each panel or you can hit the “Scratch All” button to scratch them automatically. If any of the dice total values are either 7 or 11, you will win the corresponding prize listed below the dice. Winning combinations on the Hot Dice scratch card are: 1 & 6, 2 & 5, 3 & 4 and 5 & 6. Your two dice total on the Hot Dice scratch card must be either 7 or 11 for you to win a prize. 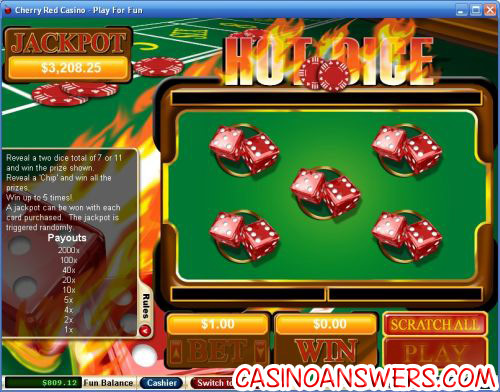 Payouts on the Hot Dice online scratch card game are: Free Game, 1X, 2X, 4X, 5X, 10X, 20X, 40X, 100X and the top fixed jackpot of 2000X. You can also reveal a “Chip,” which means you will win all of the prizes. When receiving a winning combination, your bet will be multiplied by the payout. The payouts are listed below the pair of dice once the panels on the game card have been scratched. In addition to the payouts, the Hot Dice scratch card features a progressive jackpot. The progressive jackpot on Hot Dice is triggered randomly and can be won with each card you purchase. At the time of this writing, Hot Dice’s jackpot is at $3,208. With a progressive jackpot in addition to some very generous payouts, Hot Dice is not only an easy game to play, but also gives you the chance to win big. You can get a 400% up to $4000 signup bonus to play Hot Dice, several other scratch cards and over 100 other games at Lucky Red Casino! Are USA casino players able to play the Hot Dice scratch lottery game for real money? Players located in the United States are welcome to sign up, deposit and play at most RTG online casinos, including Lucky Red Casino and Rushmore Casino. How much can I win playing the Hot Dice scratch ticket? Hot Dice has a randomly triggered progressive jackpot that can be won on any game, so that is your best bet to win big on Hot Dice. However, there is also a 2000X top fixed jackpot where you can win up to $20,000 if you’re betting $10 per scratch card game. Where can I play scratch cards online for free?